Hilo Recruiting Center Future Soldiers conduct a room clearing exercise. Future Soldiers search and detain prisoner, during this training exercise. 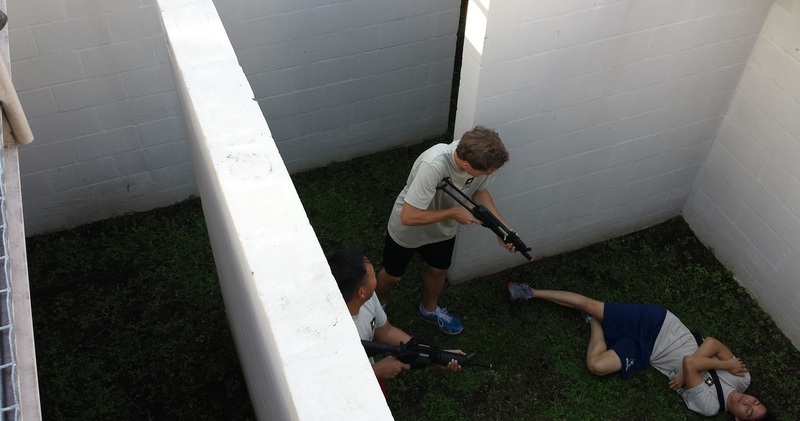 Without a Future Soldier or floor loss in more than two years, Hawaii’s Hilo Recruiting Center may have created possibly the best Future Soldier training program in the command. Training is conducted every Thursday from 3-6 p.m. and a field training exercise is conducted on Friday’s from 6-7 a.m.
Future Soldiers sound off the Soldier’s Creed and Warrior Ethos prior to the beginning of training, followed by physical training and classroom instruction on requirements training, where we talk about the basic training task list, Army values, Sharp, ACE, etc. Future Soldiers and applicants then fall into squads led by peers who’ve been selected to be squad leaders and platoon sergeants. Key leaders are chosen based on their motivation, attendance record, and number of referrals. Future Soldiers are treated as if they are in the operational Army, charged with a real mission to achieve once a quarter. Among the training: how to pull guard duty, challenge and password, search and recovery of a prisoner, set up 360 security, patrol formation, field sanitation, and clear building at the shooting house. Help from our local Reserve units, operational orders, realistic training using dummy weapons, shoot house, and other training materials, contribute to our Future Soldier events. Every Future Soldier has an alert roster, short term planning schedule, and used ACU’s donated by reservists. This productive program keeps our Future Soldiers motivated, encourages camaraderie and teamwork, and strengthens their passion to follow through on enlisting. This program is turning out to be more productive than we expected. For example, one of our Future Soldiers told his Future Soldier platoon sergeant that he wasn’t coming to training anymore. The Future Soldier platoon sergeant notified us, and we were able to avert a Future Soldier loss.